I’ve said it before. In fact, I’ve said it here… and here… and here. Oh, and here. 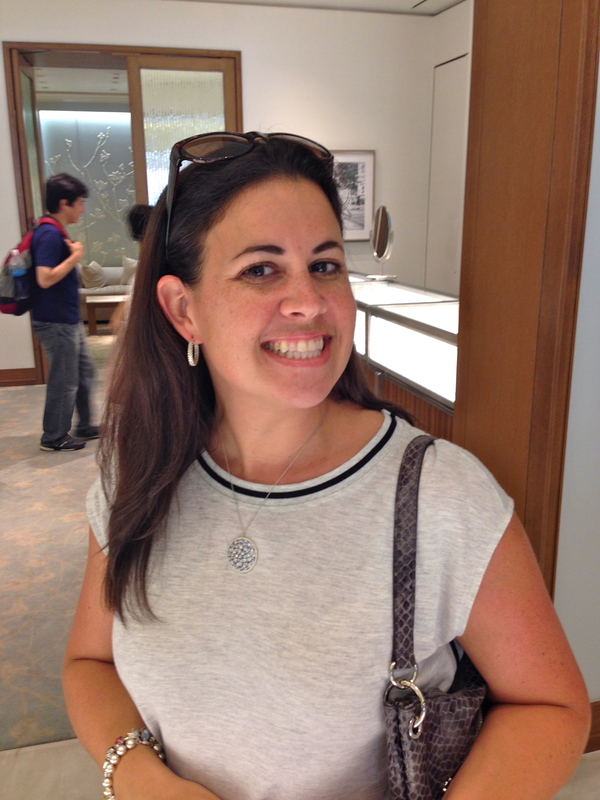 Tiffany & Co. is the best store in the world. And in case I haven’t made you a believer yet, allow me to spend yet another blog post trying to convince you how fabulous this store really is. And I’m not sorry. We got our coffee, and because my bestie is the best bestie in the world, she was happy to let me wander through the mall and swoon over the store’s entrance, which was flanked on three sides by beautiful tiffany-blue lighting. She humored me and guarded my beverage and my purse while taking yet another photo of me in front of a Tiffany & Co. sign. And the security guard comes over and asks if he can be in the picture with me. Here’s where I knew I’d be having yet another great Tiffany’s experience. 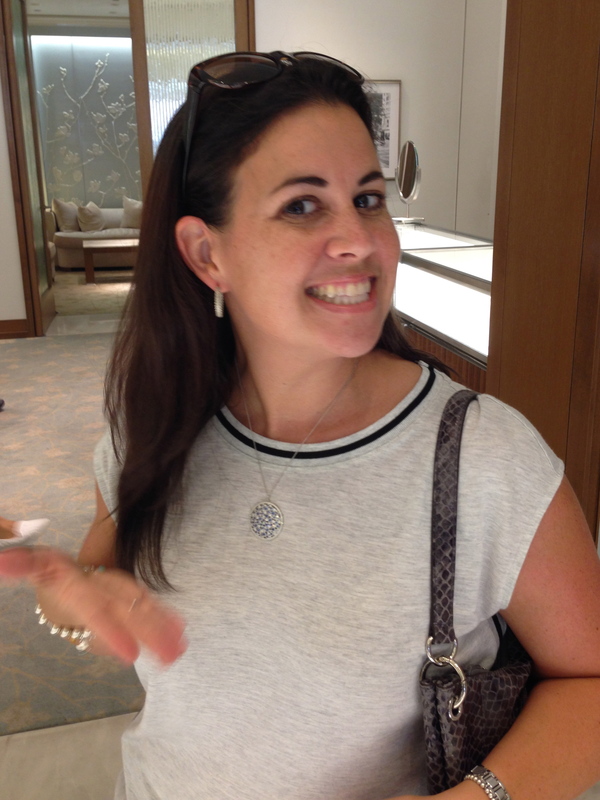 Here’s where this visit to Tiffany’s became my favorite ever. Here’s where I knew I’d be writing another post about this establishment and its total awesomeness. After my photo moment with Ben, Sanne and I went in to look at all the goodies. We were immediately offered assistance by a salesman with an incredibly kind face, to which I politely declined. I explained that I wasn’t going to buy anything, I was just looking to get some ideas for my upcoming birthday. Sanne and I walked around admiring all the pretty things – and then I saw it. 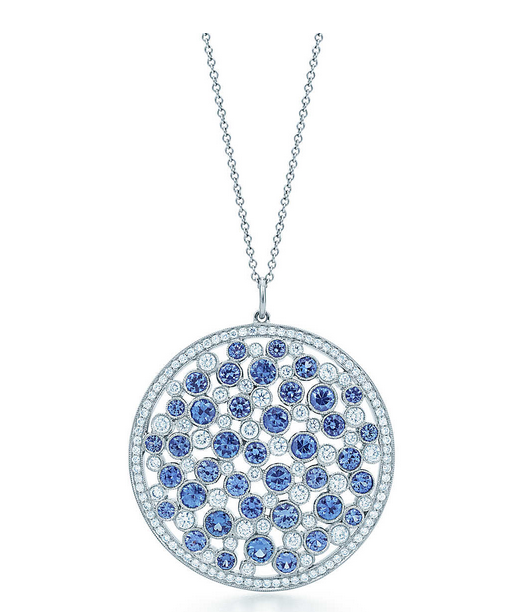 This is the Tiffany Cobblestone Medallion Pendant. It is by far my most favorite item the store has to offer, and I had never seen it in person before. I asked the kind-faced salesman, John, if there was any way I could try it on. He didn’t even hesitate – he pulled it right out of the case and while my jaw dropped to the floor and tears began to form in my eyes he brought it around the counter and clasped it around my neck. I’m still in shock. Can I just stop for a minute and say again that this is the most stunning piece in the entire Tiffany & Co. collection? We finished looking at everything, but before we left I asked John to take a picture of Sanne and me. He looked around the store for a minute, then found the perfect backdrop. I wish this picture did it justice – the wall behind us was beautiful. Then I took one with John too because, after all, we had become such good friends by this point. I asked him if he was okay with me posting his picture on my blog, and he got all excited, writing down my blog’s web address and complimenting its name, which then led to a brief conversation on Slurpees, Icees, and slush puppies. 🙂 In case you can’t tell, John is awesome. He then called Ben (the also-awesome security guard of entrance-photo fame) over and told him that the two of them were going to be in my blog post. 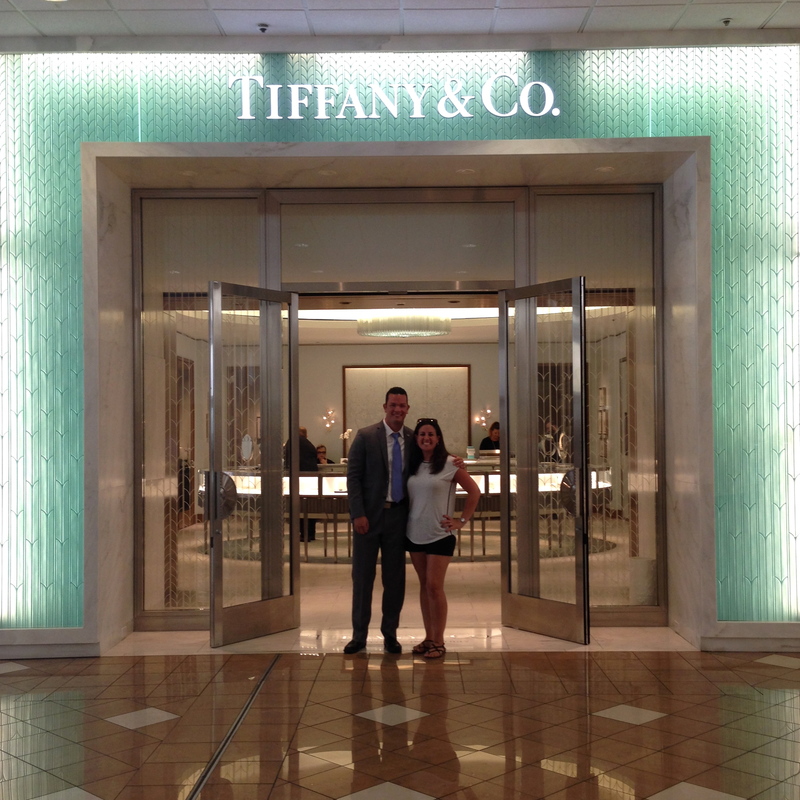 Sadly though, we couldn’t stay all day, and Sanne and I bid adieu to our new Tiffany & Co. besties. On our way out John gave me his business card and told me that he hopes I get my necklace someday. This really was SOOO much fun!!! They couldn’t have been nicer or more welcoming if they tried. Aww me too!!! ❤️💗 Onto the next trip!!! !